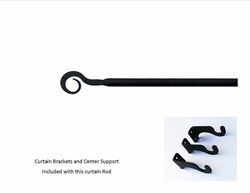 Tapestry/Curtain Curl Rod Set (61-112") - Old World Elegance within your reach! Add some contemporary style to your windows with this Tapestry/Curtain Curl Rod Set. Yes, that extra curl to your curtain or tapestry rod will go a long way to set that modern tone to your windows! • Extends 61 In. to 112 In. This measurement does not include the Silhouette is or finial ends. • Silhouette is 2 In. W x 1 1/4 In. • H BRACKETS AND CENTER SUPPORT INCLUDED and Measure 3/4 In. Width x 1 1/4 In. High x 2 5/8 In. • Minimal care required - simply wipe clean with damp cloth. • No harsh cleaning supplies needed. • When measuring your windows, remember to consider adding roughly 4-Inch to each end (the space the finials will take up). • Consider the stack back space necessary for hanging draperies; stack back space is the width drapery will occupy when fully open. • Remember to consider how long the curtains will hang, because treatments hanging too low to the ground or too high might not look correct. • Always a good rule of thumb is to measure everything before installation.